Because no great story started with someone eating a salad." Visiting old Vineyards, when on our annual Wine Tour always makes our heart skip a beat. Looking at these decade old vines, cowering near the soil, is an overwhelming feeling, knowing that these survived severe weather conditions and the chance to be ripped out because being declared unprofitable. Unprofitable because of the low yield they produce; but thankfully to a few ambitious minds with burning hearts, these enchanted-looking vines get a second chance. Recently the Certified Heritage Vineyards Seal was launched, which is a big step for the Old Vine Project, brainchild of Viticulturist Rosa Kruger. This seal makes South Africa the only country whose wines can put forward a claim to be made from fruit off old vines. Members of the OVP may use the seal, and include the planting date of the vineyard. Old vines make wines with a unique character. 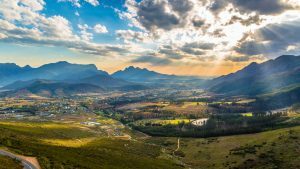 Wines that reflect the vastness of the South African landscape – the harsh climate, the old and sometimes fragile soils, and the complex culture. They reflect the decades of growing in one place, in the unyielding sun, the cold winter rain, the storms and winds, on a mountain, on a plain somewhere and then producing these delicate but powerful wines. As many of you might know already, we will be soon heading of to our annual journey through the beautiful South African Winelands. This year we will revisit old estates, but also say "Hi" to new ones and hopefully introduce their produce to our portfolio. The name is synonymous with luxury and haute cuisine. But, what is Chateaubriand, exactly? Contrary to popular belief Chateaubriand is not a cut of meat. Rather, a method of preparation, or a recipe. It is traditionally made from a thick center cut of beef tenderloin. The cut weighs about 350g, and generally intended to serve two. Have it with a elegant Syrah from Metzer or try it with the lighter fruity Metzer Cinsaut for the not so chilly days. To name a few estates, Allée Bleue, Metzer Wines and David & Nadia, will soon have this seal featured on their bottles. Look out for it. It means something good.